We deliver this value proposition by focusing our efforts on 3 major areas. Together we are here to achieve the common goal of "Improving Patient Care!" BackChart, LLC is an EHR company founded in 2006 by Dr. Leo Bronston a Chiropractor in practice for 30 years. BackChart was originally developed for his 6 clinics in southwest Wisconsin, but has now grown into a national company. Specifically, he was in need of a record keeping tool that streamlined and created efficiencies within the office and provided quality assurance in regards the documentation of a patient's encounter. The product was first released in January 2010, and received full certification for Meaningful Use in August of 2011. Our vision is to be the premier Chiropractic EHR Vendor, and our mission is to be the most affordable, reliable, user-friendly, and patient-centered software on the market. In July of 2011, BackChart released our unique Patient Portal that allows patients to electronically update intake information & quality-of-care measures. The portal helps streamline office workflow and maximize efficiencies. In September 2011, BackChart entered into a partnership with Cvikota, an outsourced billing company. Cvikota Company has been about the business of revenue cycle management of over 40 years, and is a proven provider of medical billing services, practice management software, and electronic document storage. In June of 2012, BackChart began implementation in the clinics at Northwestern Health Sciences University (NWHSU). BackChart has a 10 year contact with NWHSU; all students receive 1 year of free service. BackChart consultants are working with Stratis Health to help the university succeed in a seamless transition to electronic health records. In July of 2012, BackChart entered into a partnership with Kareo, a leading provider of web-based medical billing software. We have created a bidirectional data integration that allows users to seamlessly manage the clinical charting and medical billing process without any data duplication. 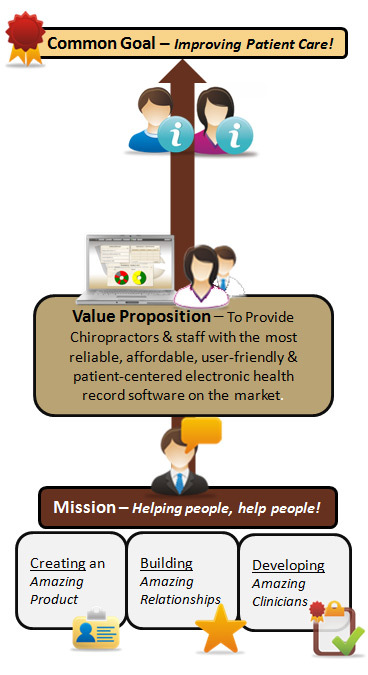 BackChart is growing everyday and will continue to provide premium EHR software to Chiropractors everywhere!